Affiliates are not partners, owners, or joint venture partners in legal terms. As an affiliate, you are acting as an independent contractor, and are legally responsible for all of your actions. Under no circumstances may you use SPAM or UCE (Unsolicited Commercial E-mail) to promote our website in any way. This is grounds for immediate removal. Please see the above section for more information on spamming. You may not falsely represent yourself as an official agent of our website. While you are welcome to use our promotional materials provided to affiliates, such as logos, graphics, and content, they are the property of our website and copyrighted material. Our promotional materials are to be used only to promote our websites. You may not engage in deceptive advertising. You are responsible for any liability for false or unsubstantiated statements made through endorsements, or for failing to disclose material connections between yourself and ListRecon.com. Endorsers also may be liable for statements made in the course of their endorsements. You indemnify ListRecon.com of all wrongdoing and all liabilities if something you say or do results in legal action. You agree to fully disclose your connection to ListRecon.com. You are solely liable for any promotional material created by you and the information you represent. False claims are not our responsibility, and may result in the loss of your account. 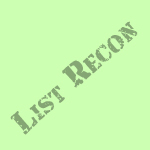 To receive any commissions earned, you must agree to the affiliate agreement of ListRecon.com. Failure to do so indicates that you do not wish to be an affiliate at ListRecon.com and agree to forfeit all earnings. It is your responsibility to make sure your email address for your PayPal account is correct. Commission payments made to the wrong account because you submitted incorrect information is your responsibility. Should your account at PayPal be locked or restricted for any reason, that is also your responsibility. ListRecon.com will not be held liable. Removal of your account will result in the permanent loss of any commissions owed, future sales, and referrals in your downline. Accounts removed for rule violations forfeit all earned commissions. We have the right to amend, update, or change this agreement at any time without notice.